Fiji’s inclusion as the latest member of the US’ anti-Daesh coalition in Syria has nothing at all to do with protecting the island nation’s people from the world’s worst terrorist group but is the US’ way of pressuring the country to send a none-too-subtle signal to China. 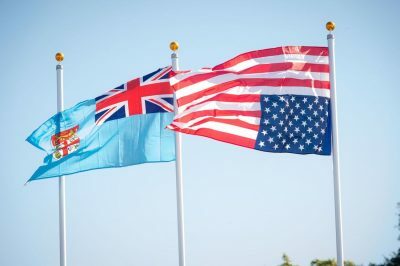 A rather peculiar bit of news emerged earlier this week when the official Twitter account of the US’ “Operation Inherent Resolve”, the formal name of its anti-Daesh coalition in Syria, posted that the South Pacific Island nation of Fiji became the 79thmember of this campaign. The country is literally located on the other side of the world and has no interests whatsoever in the Mideast, nor is it facing any credible threat – whether immediate or latent – from the world’s worst terrorist group. No further details have been forthcoming thus far so it’s unclear whether Fiji will physically “fight Daesh” (which has nowadays become a euphemism for perpetuating the occupation of Kurdish-controlled northeastern Syria) by volunteering its soldiers as cannon fodder for the US or if it’s just signing on for symbolism’s sake. Whatever the official role that it’ll play in this multinational coalition, one thing is certain, and it’s that Fiji’s official membership in this US-backed military scheme is designed to send a none-too-subtle signal to China precisely at the moment that the US’ “Lead From Behind” Australian ally is flexing its regional muscles on Washington’s behalf. The proof of this was most visibly seen in Australia tightening its strategic vice-grip over Vanuatu after a fake news campaign fear mongered about an imaginary Chinese naval base there, which followed France’s reaffirmation of interest in the region and the de-facto creation of the “Hex” of anti-Chinese regional forces in the Afro-Pacific. Furthermore, Reuters recently made a hullabaloo about China’s supposed “weaponization of tourism” in Palau, thereby preconditioning the global public to accept the Pacific Islands as the latest theater of New Cold War competition. For those who might not be aware of Fiji’s history, the country was recently shunned by the West after its 2006 military coup, the leader of which still serves as its Prime Minister. It was during that time that China brought the country in from the cold, proverbially speaking, and made impressive strategic inroads with the most influential state in this geographically broad but sparsely populated space. The West normalized its relations with Fiji since then after lifting its sanctions against the country in 2014, but it appears as though they’ve somehow managed to convince its leadership of the need to join the anti-Daesh coalition in Syria in order to also send a signal to its strategic partner China. It can’t be known for sure, but two possible explanations exist for why this happened. The first one is that Fiji strategically capitulated to the US and Australia, striking some sort of deal with them to avoid any prospective anti-Chinese pressure against it in exchange for gradually moving away from Beijing. This interestingly resembles the second explanation except for its intent and intensity, which is that the decision shouldn’t be seen as anti-Chinese but rather as part of a delicate and circumstantially necessitated “balancing” act, the success of which could lead to the reinforcement and possibly even strengthening of China’s strategic presence there if it ends up deterring the “Hex” from destabilizing Fiji. It’s far too soon to say which of these two explanations most accurately accounts for why Fiji joined the anti-Daesh coalition, though it’s fair to say that it nevertheless sends a none-too-subtle signal to China that the US remains the South Pacific hegemon.